Honey in the morning, honey in the evening. 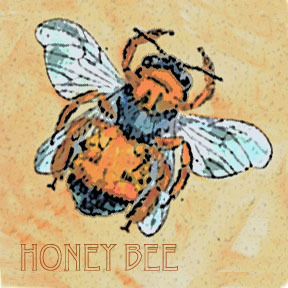 Honey is a staple in my Sicilian kitchen. I drizzled this light, delicately scented gift from the bees onto rustic breakfast sandwiches. Assembly was a breeze – toasted crusty ciabatta bread + a layer of marscapone + strawberry slices + honey = sticky fingers and a delicious way to start the day. I mixed together equal parts of fresh lemon juice, orange juice and olive oil, about a tablespoon of each, and a teaspoon of honey in a serving bowl. I scrubbed a couple of carrots with a vegetable brush, cut them into thin slices and added them to the dressing along with the leaves from a couple of stems of mint that I had cut into fine ribbons, a bit of lemon zest, salt and pepper to the dressing. I was Surfing for something completely different, but got your Honey Strawberry Sandwich and Minted Carrot Salad and found it Interesting.Thanks. Wow. So simple and at the same time so delectable. Thanks, Carol! Amazing, how often simplicity is the key. I love the flavor of honey. 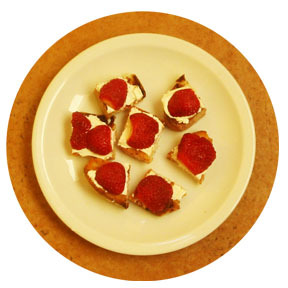 Those little honey strawberry sandwiches look heavenly! The warm day with a sunny sky and no snow made it all the better! Yes for the honey aroma filled kitchens.. I just bought a huge container to make one of my favorite Italian nougats. Carol your art, writings and recipes are all beautiful. I enjoyed reading your post on your arrival in Siracusa.. how wonderful to look out onto the blue-green Mediterranean through your kitchen window. And when you are out at the market again, you can get me some squid! Love squid soup. :) Ciao..
I’ll try to email the squid to you. Perhaps if I scan it first???????? There are at least four types of shrimp at the market. I think of your blog and cooking when I look at the amazing seafood. I really love the supreme freshness of both of these dishes! Wonderful, you just took care of at least one breakfast and one lunch for me this week. Very nice recipes Carol. Having access to the fresh and lovely food at a market everyday is certainly inspiring. Thanks for your kind words. I’m trying to post nearly every day so I hope you will check back and find other recipes that appeal to you.